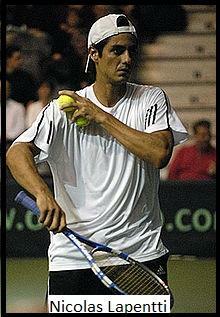 Nicolas Lapentti is one of the top male tennis player from Ecuador country during 90s and 2000s. He has won five singles titles in his career. To know more about the profile and career of this player, read the following article. Nicolas Lapentti is former tennis player. He is from Ecuador. He was born in Guavaquil, Ecuador on 13 August, 1976. He turned professional in 1995 and retired in 2011. He started playing tennis from very short age of six. In 1994, he won the Orange Bowl. He won the junior doubles titles at French Open partenering Gustavo Kuerten and US Open where his partner was Ben Ellwood. Nicolas Lapentti become professional in 1995. In the same year he won his first singles title at ATP Bogota held at Colombia. In 1997, he reached the second round of the French Open and US Open of that year. His year end ranking was No. 63. In 1999, he reached the semi-final of the Australian Open. He also won his second singles title at Indianapolis Tennis Championships where he defeated Vincent Spadea by 4-6,6-4,6-4. At the end of year 1999 he was ranked No. 7 singles player in the world. In 2001 he won Austrian Open by defeating Albert Costa by 1-6,6-4,7-5,7-5 in the final. Having won two Boy's Grand Slam titles, Lapentti also has a good record in doubles at senior level. He has won three doubles titles in his career. On 10 May, 1999 he reached his highest doubles ranking of No. 32. Sebastien Grosjean is one of the top male singles player from France during late 90s and early 2000s. A right-handed player with two-handed backhand style he has won four singles title in his career. Read this article to know more about Sebastien Grosjean.